Hi Everyone! Candace and Michelle here..
Before we get to Kate's project today we want to share that this is Kate's last project here with Jaded Blossom. Kate has decided to step down from her design team duties so she can spend more time with her family. But don't worry, I'm sure we will still get to see her fabulous projects in the Facebook Group from time to time. We wish Kate the best of luck! We will miss her, her awesome coloring and fabulous projects! Hello Everyone... It's Kate with you today with my last post for Jaded Blossom. The past 2 years have been Amazing especially working with Candace and Michelle and there Super Talented Design Team. Unfortunately, with 4 kids wanting this Mama's constant attention lately, I felt it better to just step down from the Design Team. For my last project today, I made a little centerpiece. 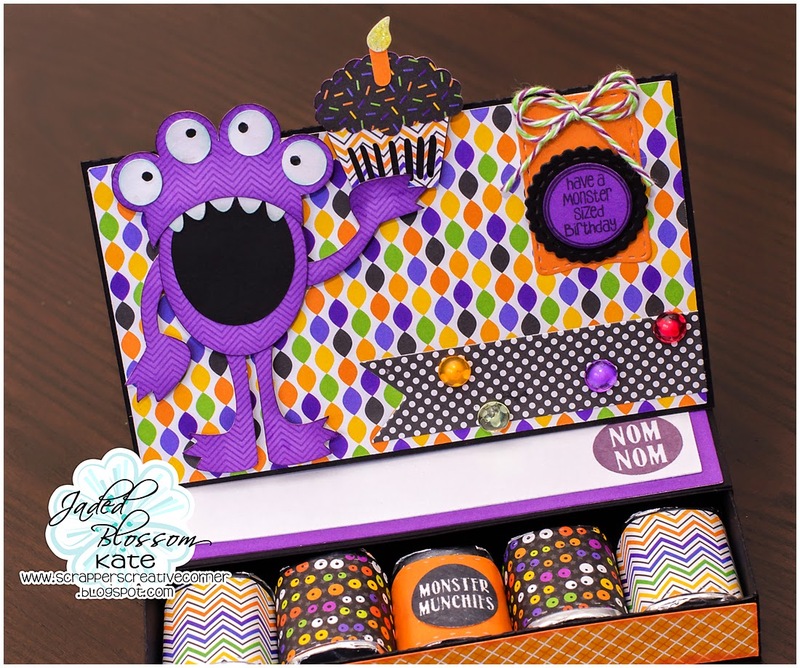 I used Halloween Dies and Spooky Label Stamp Set. I cut the pumpkin and bats using Vinyl, yes our awesome dies can cut through vinyl as well as felt in case you didn't know. Happy Monday! Tanya from Crafting on Caffeine and today is my Day here. I am excited to show you this yummy treat! 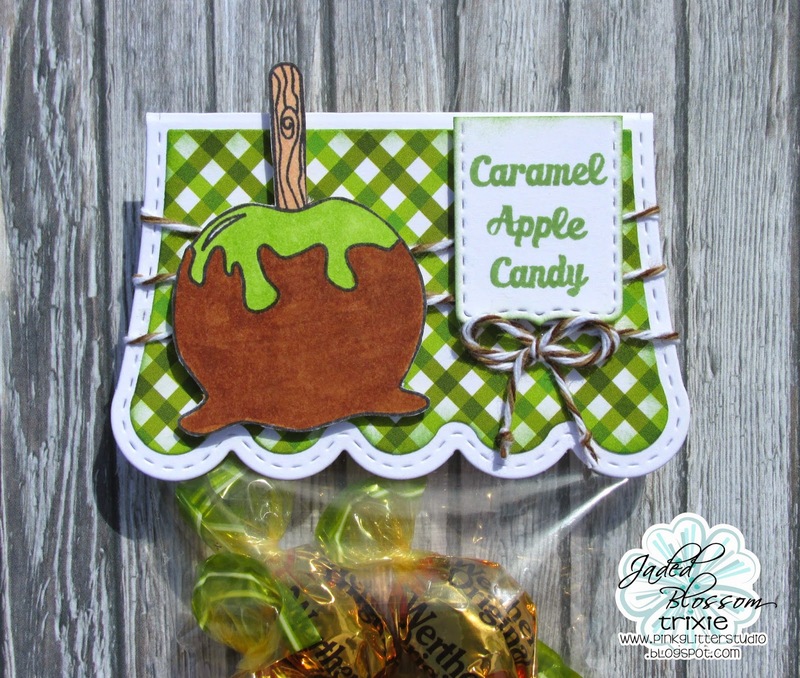 I made my own Caramel Apples using the Apple Die and the Sign Post both from the Fall Dies Set. I cut the Apple die 3x for each apple. then I used Glossy Accent to make the apple shiny. 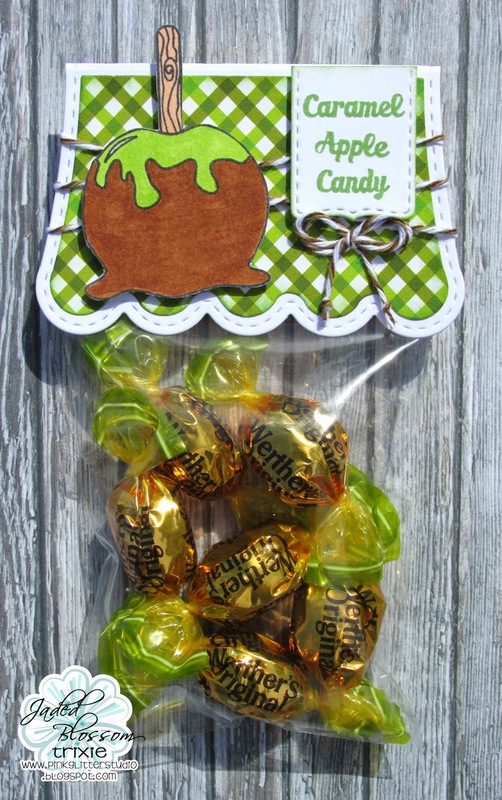 The treats inside the bag are Caramel Apple chocolate cups. I thought it was great with this treat but not sure about the taste. Welcome to the Animated Blog Hop Event!! How fun is this going to be? Cheery, Bright and Animated, we have a great Hop lined up for you! This hop will run for 48 hours, unlike our typical 24 --- so don't rush, enjoy the projects and make sure you follow and play along according to the guides below! The hop begins over at Jaded Blossom, in case you didnt start at the beginning. As always, this hop is sponsored by Jaded Blossom & SVG Cutting Files. so fill out the form ONLY if you agree to abide by our TOU. **Filling out the form is NOT a guarantee of files... please be patient while the system verifies your information and it will redirect you to the landing page to collect your downloads. 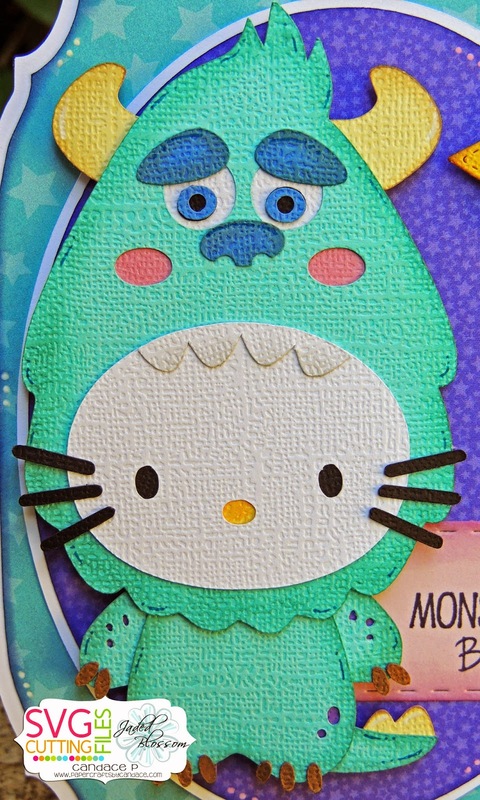 I love love love this Sully Hello Kitty crossover! This card base is from SVG Cutting Files! From Jaded Blossom I used the Star Dies, Ticket Book die and Monster Mash stamp set. Thanks for checking out my project! Click below to continue on to Ann! Got Confused (Squirrel!) in the hop? Here is the complete line up to help you out! Hello! 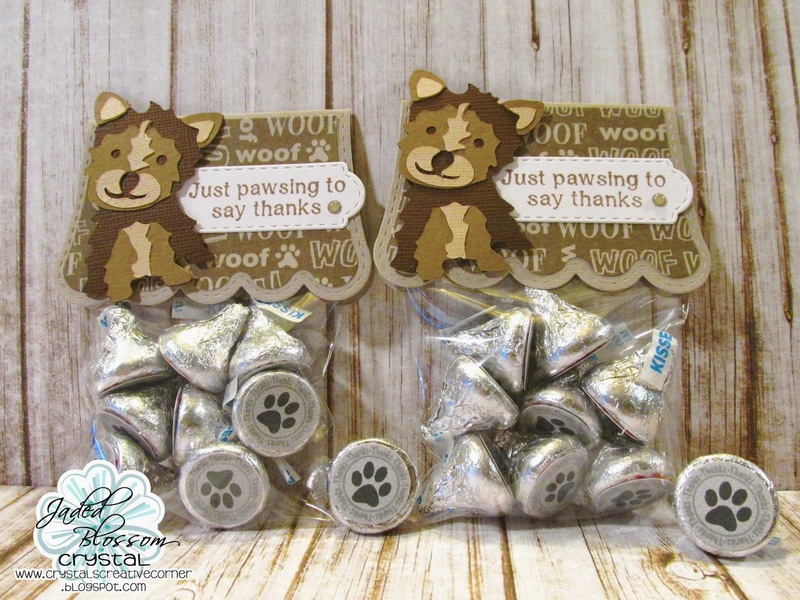 Mel from Doxie Mel Designs with a easy to create treat today. The container and wooden scoop are from Jaded Blossom. The wooden scoop has a metal loop "screw eye" from the hardware store that you can hand screw into the handle. I picked up a package of 10 for around a dollar at Home Depot. I like to tie the scoop to the treat as I am the type of person that will lose things quickly. 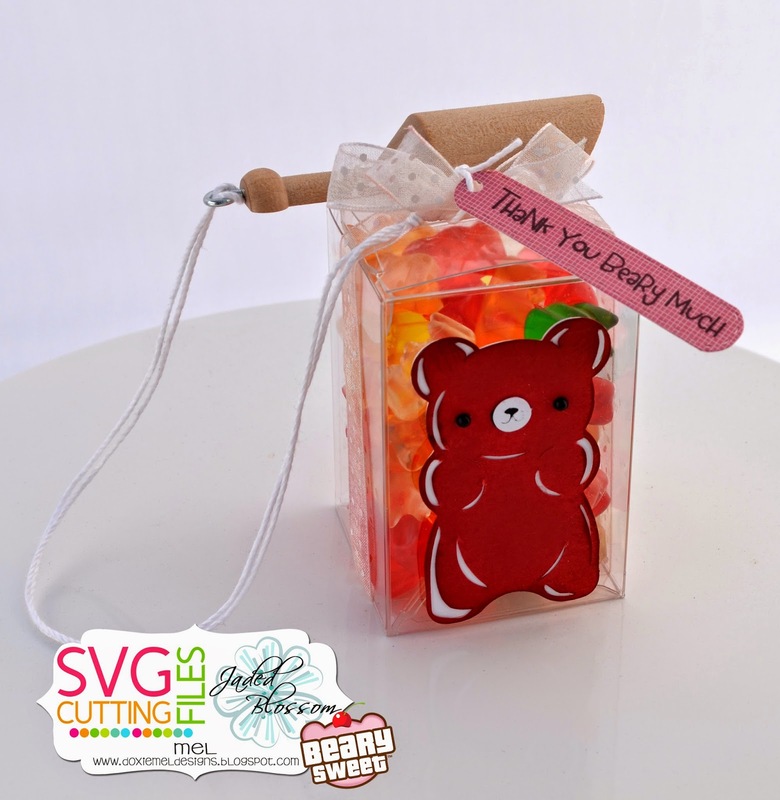 To go along with the gummy bear theme, Mr. Gummy Bear is NEW from SVG Cutting Files and will be at their store this Friday! The bear is from "Beary Sweet" collection. Thanks for stopping by today! Hope to see you tomorrow for the Animated Hop! Today I used Jaded Blossom's Science Matters, Treat Tag Die, Candy Wrap Dies and the 1x6 Clear Tubes to make a cute little birthday treat. 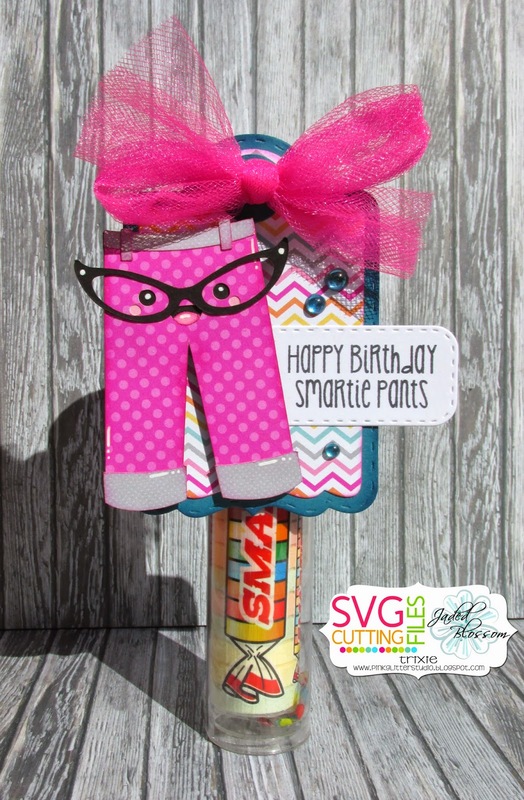 I just love this little Smarty Pants file from SVG Cutting Files. ADORABLE!!! I used the jumbo size Smarties and they fit perfectly in the Jaded Blossom 1x6 Clear Tubes! 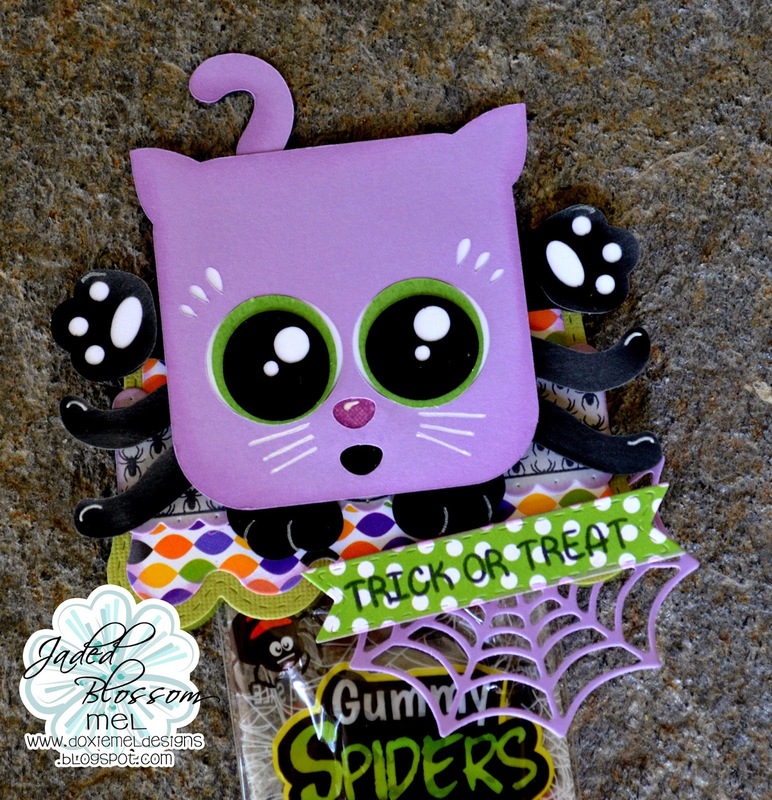 I used some pink tulle to attach the Treat Tag Die and then added some Queen & Co. Bubbles. It is Crystal from Crystal's Creative Corner! Today is my Jaded Blossom Design Team Day. 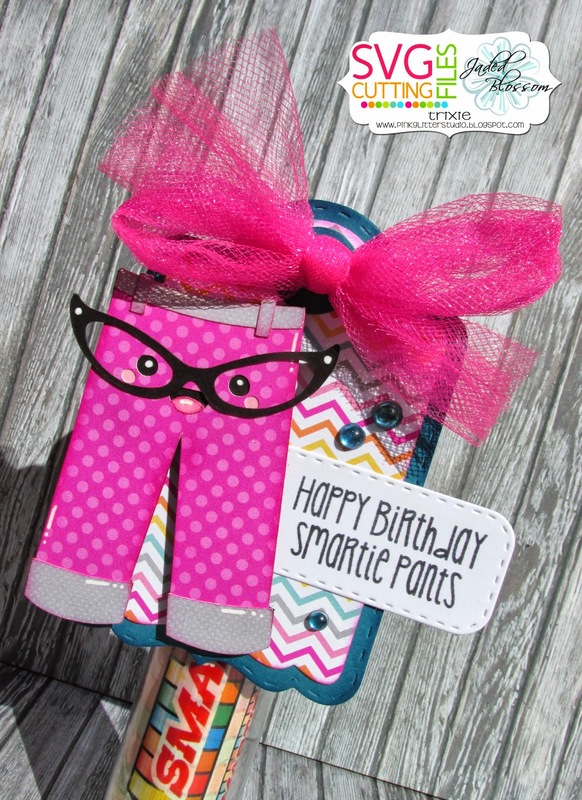 I made a gift card holder/birthday card. I used the Jaded Blossom Gift Card Die on the front of the sign card part. Fall is here and it's time to get the pumpkins out. 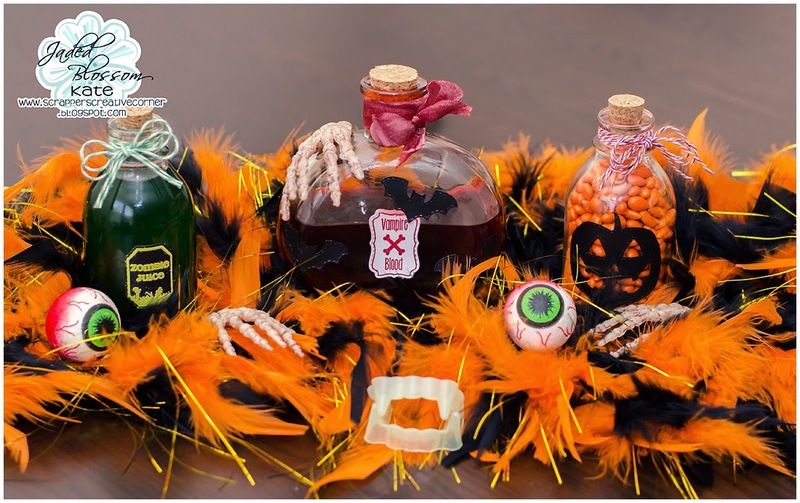 Barb from BugBites here to share a little decor item to get you in an autumn mood. 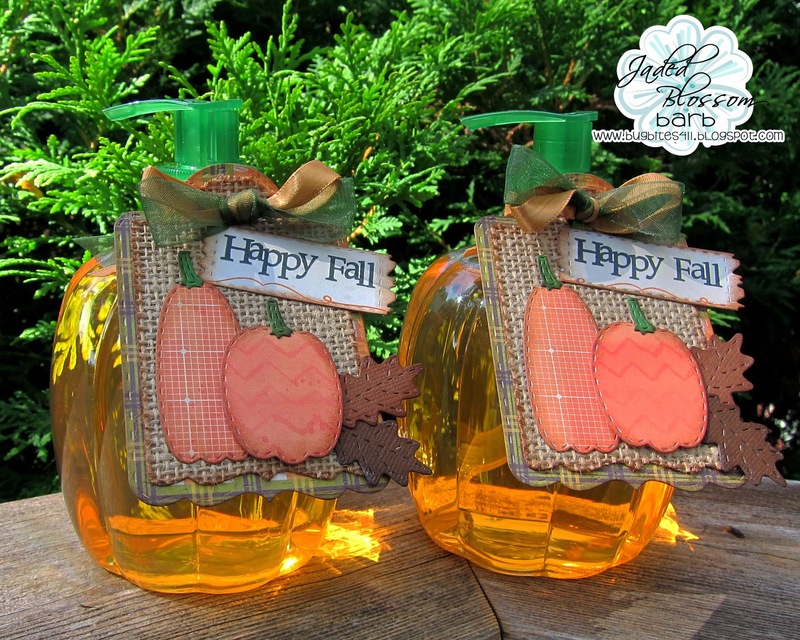 These pumpkin soap containers are perfect for a little fall decor in the house or as a fall treat for the neighbor. A simple tag makes them ready for gift giving. 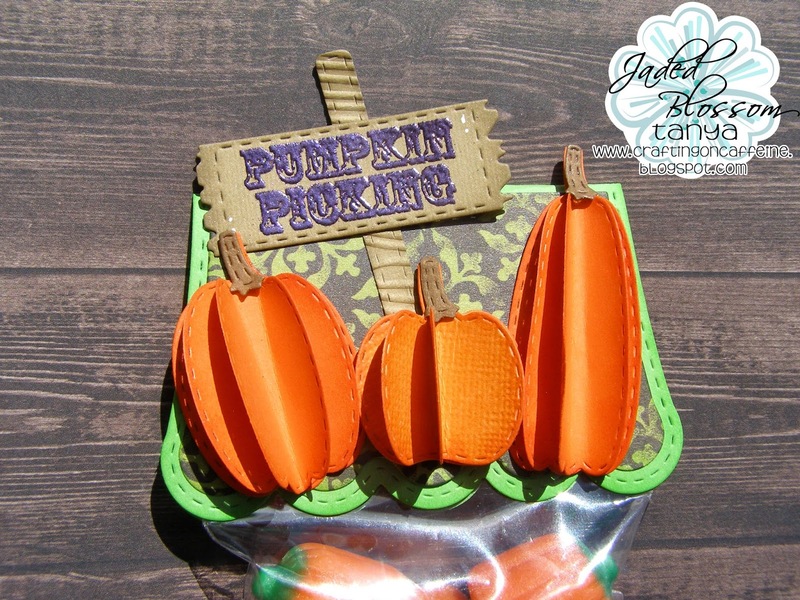 I love this burlap paper for fall projects. It adds great dimension to my tags today. Tools I used for the tags: Treat Tag Die, Fall dies, Harvest Sign stamps and some pretty ribbon. 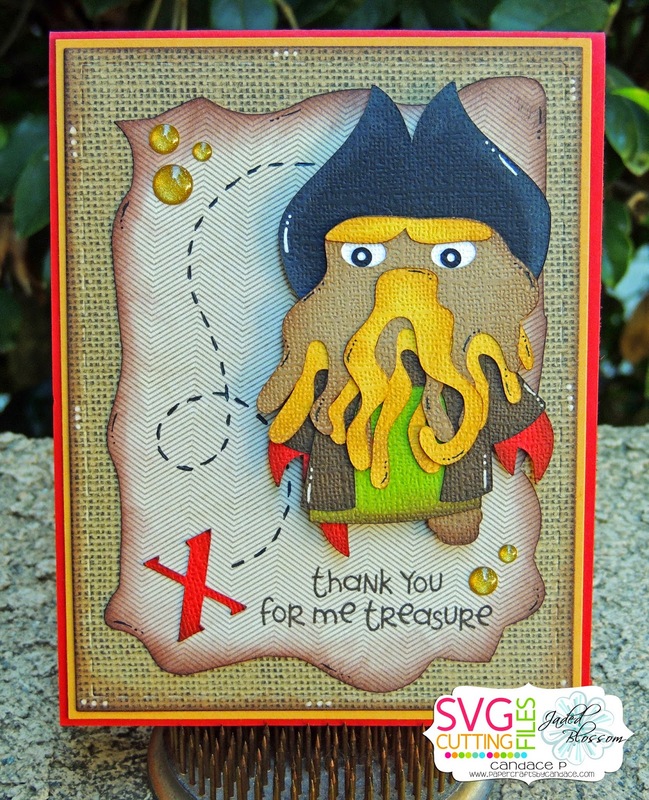 Ahoy and Avast for our Talk Like a Pirate Mini Blog hop! Me name be Almost Blind Rachel. Click here to find your Official Pirate Name!! Ye are welcome, if you dare, to join our Talk Like A Pirate Mini Hop. There best be 'no fooling around here, or ye will be forced to walk the plank! Now ye don't want to miss any stops along the way, saavy? 1- Follow each of the blogs on this mini hop --there be 9 in total mate! 2- Leave a comment on each of the blogs in the hop - watch yer bones about ya, if you cant say something nice, we will make ya walk the plank! 3- Submit your form to receive your free files -- if ye don't follow the screen prompts, don't be a scalleywag and say ye never got your files. only bilge rats try to steal! **Terms and Conditions apply, so fill out ye form and be patient will ya? Lets all be smartly about the hop and have a beauty of a time! Aye Aye and now for the projects!! 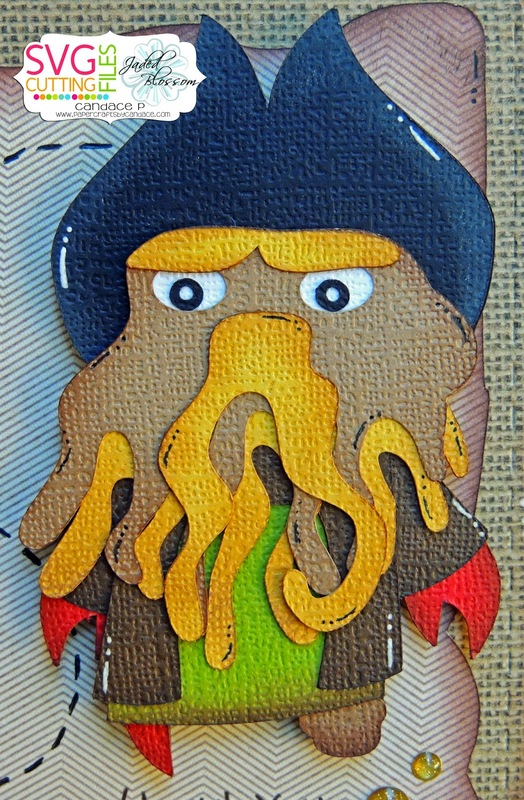 I made a card with Davy Jones! The map and X are from SVG Cutting Files "Pirate Life". I just enlarged it large enough for the mat. I used Jaded Blossom's Card Mat Dies and Pirate Booty stamp set. Thanks so much for hopping! Click BELOW to request your treasure! Got ye self lost eh? 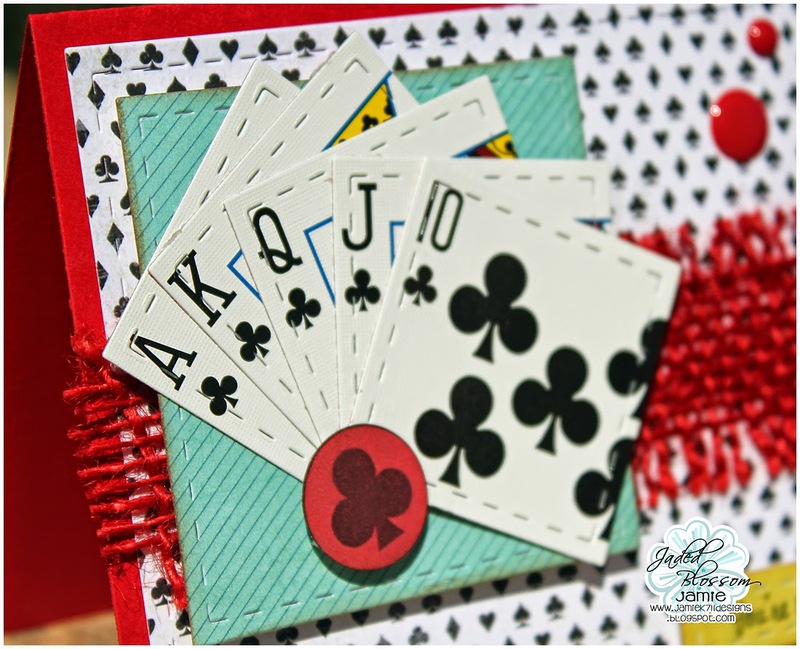 Jamie here to share a card I made with this Month's Spotlight Set... Game Night! 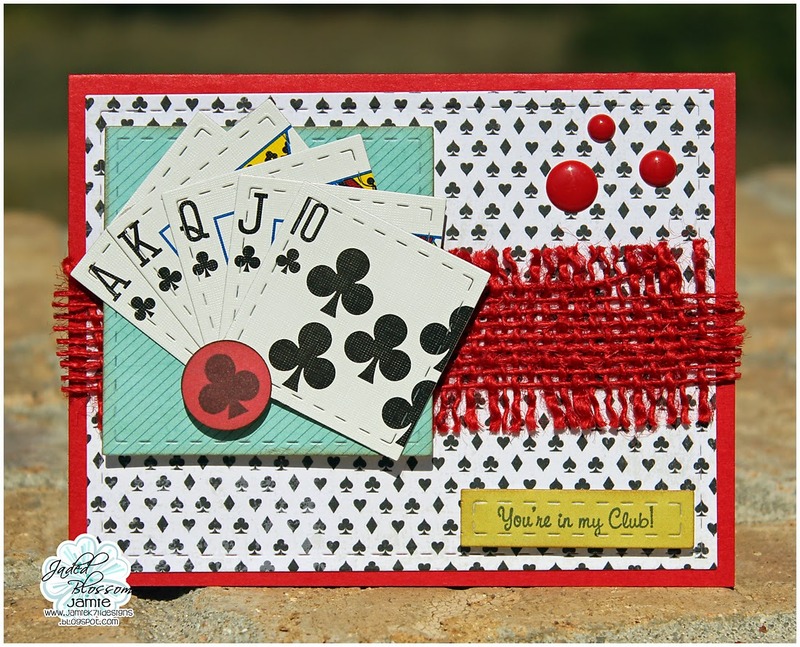 I used a few of the Card Mat Dies to create this card, along with a sentiment and candies stamp from Game Night! I took some real playing cards that I bought from the dollar store and cut them with the smaller square Card Mat Die to make the "hand". 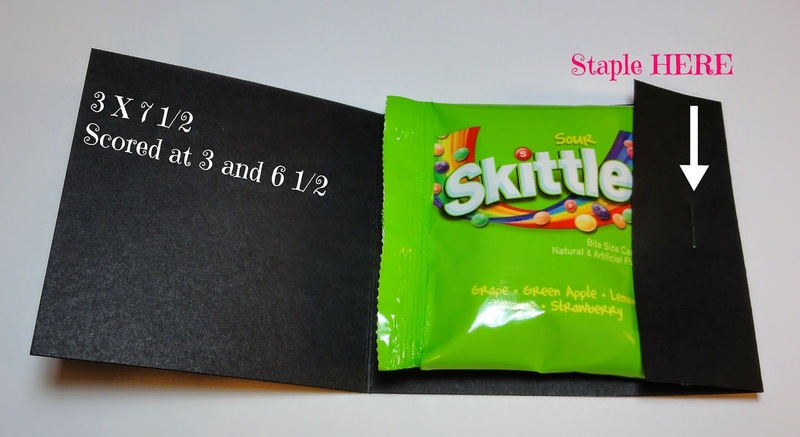 Then I used a candies stamp to look like a card hand holder. Good Morning Everyone, Kate here with you today. 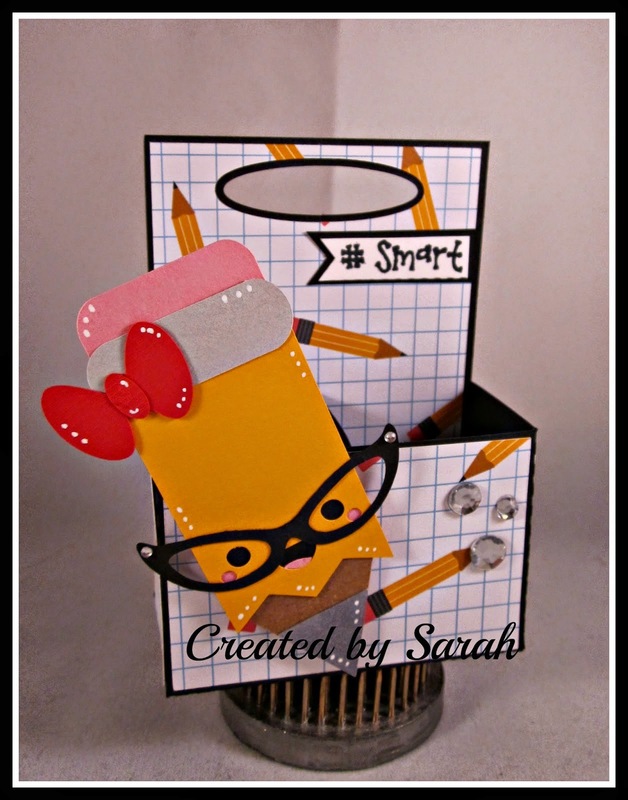 Opps almost forgot I used the 6 x 6 Doodlebug Paper that you can find right here on the Fun Extra's Section. Hello, Tanya from Crafting on Caffeine here today! 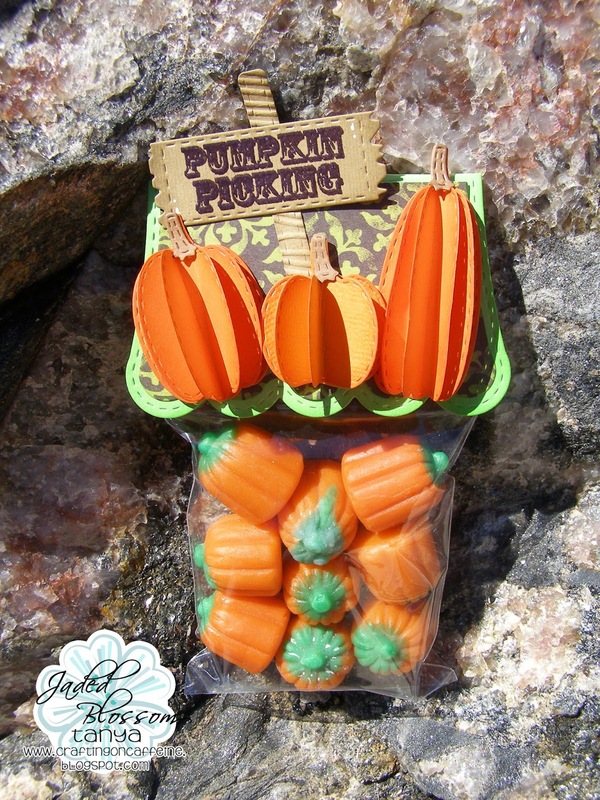 I am so excited to show you these cute 3-D pumpkins. I used the pumpkins from the Fall Dies. Each one is cut out 3 times, then glue down the middle of each one. When dried I fold so it pops up. I also embossed the words on the sign. We love seeing all your creations over at the Jaded Blossom Garden of Creativity so be sure to stop by and share. 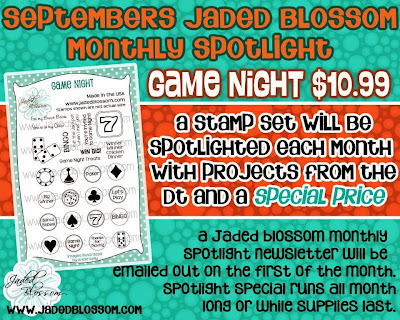 Also don't forget about the Jaded Blossom Monthly Challenge-Create Any Treat! Hello Everyone! Mel from Doxie Mel Designs stopping by with a "Spider Treat". 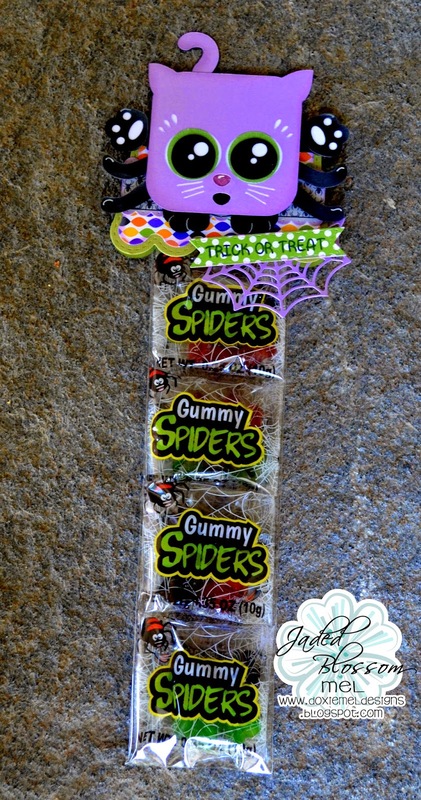 I found these gummy spiders and slid them in a favor bag from Jaded Blossom. The top of the bag is the NEW topper Die, Scallop Slider & Topper Die. Here is a close up of the topper. The spider print from the Halloween Candy Wraps is layered behind the spider.. just to add a little more to the spider theme. 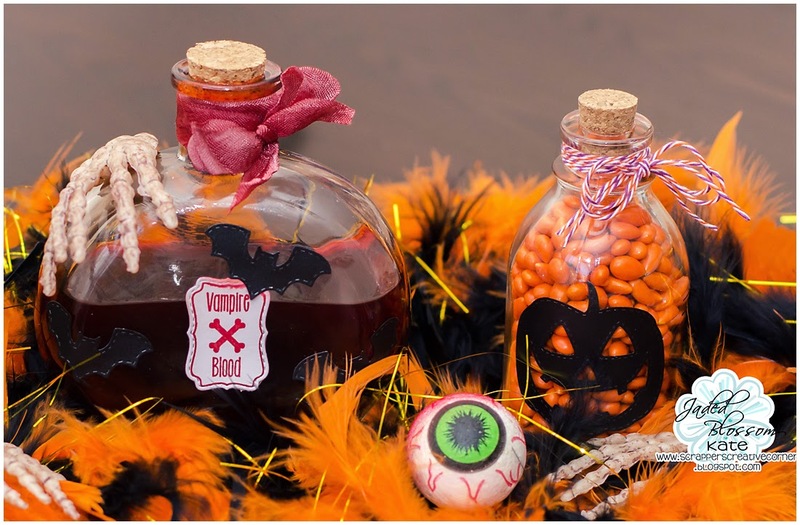 The web is from the Halloween Dies and cuts so beautifully! 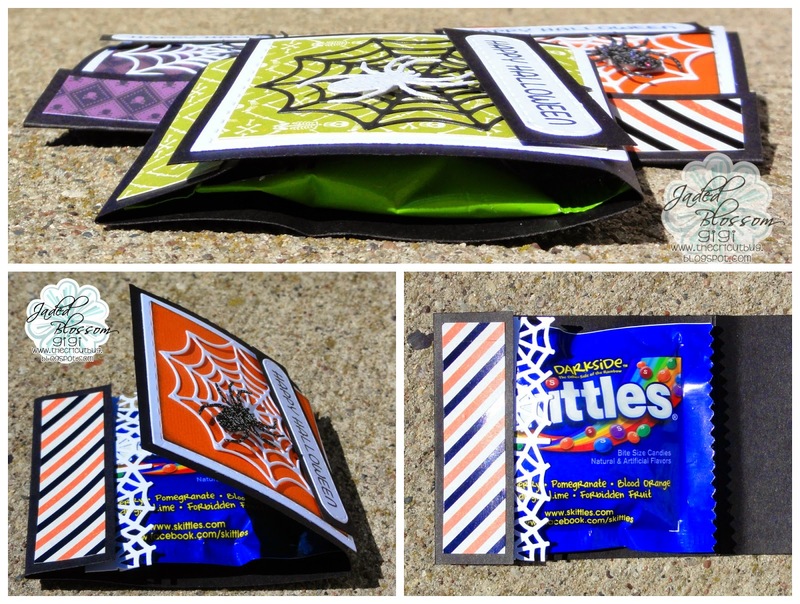 The sentiment, included on Halloween Candy Wraps, is stamped on a banner from Mini Tag Dies 2. Thanks for looking at my project- Have a great day! Yay!! It's my DT Day over on the Jaded Blossom Blog. 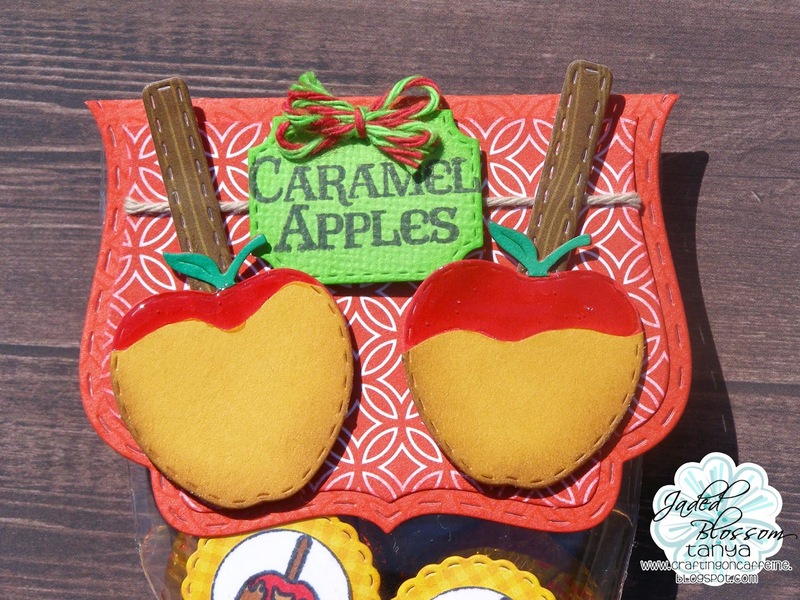 Today I used Jaded Blossom's Scallop Slider & Topper Die, Candy Charms and Banner Dies, 3x4 Clear Bags and the Freebie Caramel Apple from the September Release. I colored the Caramel Apple stamps with my Copic Markers and added it to the topper. Added some Chocolate Truffle Trendy Twine to my topper. Hello everyone! It is Crystal here from Crystal's Creative Corner and today is my Jaded Blossom Design Team day! We travel to North Carolina for our vacations a few times a year...and we take our "puppy son" with us! We found an exceptional groomer there and every time we visit he gets the best snuggles, and the best doggie treatment! So I thought I would make her a little treat from Boomer! The Yorkie Dog is from the Cricut cartridge Four Legged Friends. Happy Monday! Barb with BugBites here with a quick project using a treat that I found when on vacation a couple weeks ago in Whistle, BC. 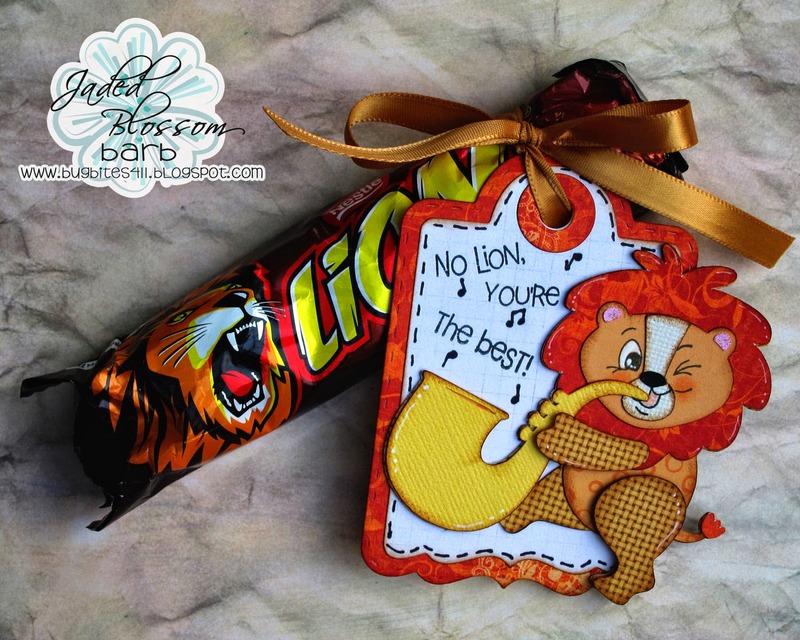 I first discovered the delicious Lion bar several years ago when I was in London. Have only seen them a few times in the U.S. so I was thrilled to find it on this recent trip. It's like a 100,000 bar but better! I did a simple tag using the Jaded Blossom Treat Tag die and the Go Wild Stamp set and tied it with a simple bow to the chocolate bar. all the details are on my blog. It's Finally Time! You are now able to purchase our September 2014 Stamp Release. This die is NOT included in Septembers Stamp Release Bundle.